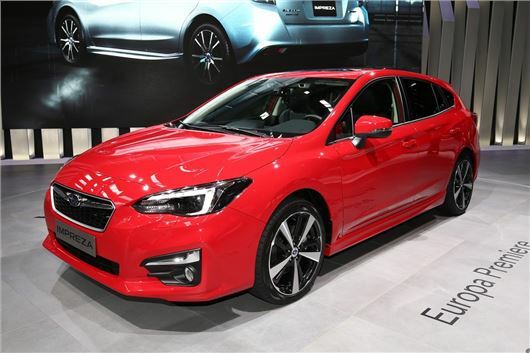 Subaru has revealed its all-new Impreza at the 2017 Frankfurt Motor Show. The new car will feature all-wheel drive as standard and will go on sale before the end of 2017. It’s been designed to continue the rugged dependability of its predecessor, but with added plushness and generous safety equipment. Prices should start at less than £20,000. The new model is larger than the outgoing car, meaning the cabin is more spacious for passengers and luggage. There’s an eight-inch touchscreen up front with Apple CarPlay and Android Auto functionality, plus there are soft-touch materials to make the cabin feel more upmarket. Subaru says the new Impreza has “firm but comfortable” ride quality and has a more rigid body than before. That should mean there’s plenty of grip on tricky, uneven roads – but if you’re expecting a real driver’s car then you’ll be disappointed by the fact there is no manual transmission. Instead, when the car goes on sale it will be fitted with a 1.6-litre petrol engine, linked to a CVT automatic gearbox. It isn’t the most potent engine, with 114PS and 150Nm of torque. Later, a 2.0-litre with 156PS and 196Nm of torque will arrive, also linked to a CVT automatic. As standard, all UK cars will come with pre-collision braking, adaptive cruise control, lane departure warning, lane keep assist, blind spot assist, lane change assist and rear cross traffic alert. High beam assist is fitted too, along with a system that alerts the driver when the car ahead has pulled away, for example at a set of traffic lights.